chainHero - Tutorial: How to build your first app with Blockchain? Tutorial Hyperledger Fabric SDK Go: How to build your first app? This tutorial will introduce you to the Hyperledger Fabric Go SDK and allows you to build a simple application using the blockchain principle. This tutorial uses Hyperledger Fabric version 1.0.0-rc1, on github Heroes-Service use the branch 1.0.0-rc1! First part This is the first part of this tutorial. The basics SDK features will be shown, but the second part is scheduled to demonstrate a more complex application. This tutorial won’t explain in detail how Hyperledger Fabric works. I will just give some tips to understand the general behavior of the framework. If you want to get a full explanation of the tool, go to the official documentation there is a lot of work there that explains what kind of blockchain, Hyperledger Fabric is. This tutorial has been made on Ubuntu 16.04, but the Hyperledger Fabric framework is compatible with Mac OS X, Windows and other Linux distributions. We will use the Go language to design a first application, because the Hyperledger Fabric has been built also in Go and the Fabric SDK Go is really simple to use. In addition, the chaincode (smart contract) can be written in Go too. So the full-stack will be only in Go! There are other SDK if you want to, like for NodeJS, Java or Python. Hyperledger Fabric uses Docker to easily deploy a blockchain network. In addition, in the v1.0, some component (peers) also deploys docker containers to separate data (channel). So make sure that the platform supports this kind of virtualization. This tutorial was made on Ubuntu 16.04, but there is some help for make the installation in Windows, Mac OS X and other Linux distributions. Dowload and install the latest Docker.dmg package for Mac OS X available on the Docker website. This will install docker-compose as well. We won’t use directly the framework, but this is useful to have the framework locally in your GOPATH to compile your app. 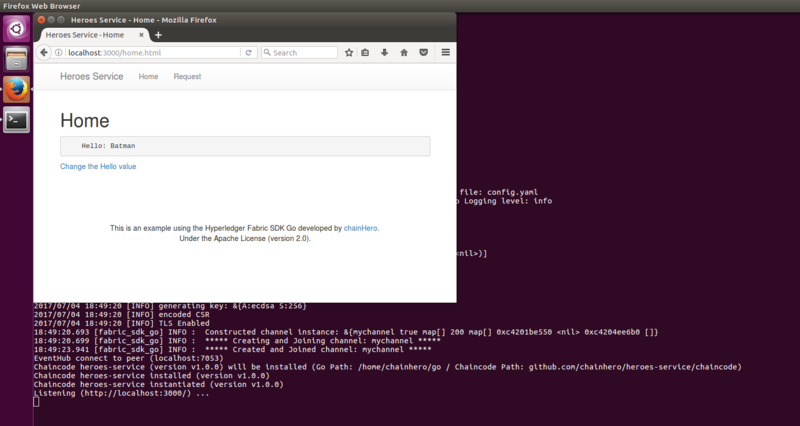 Finally, we install the Hyperledger Fabric SDK Go that will allow us to easily communicate with the Fabric framework. To avoid versions issues, we directly checkout a specific commit that works with the following tutorial. The installation can take a while (depending on your network connection), but in the end you should see Integration tests passed. During this process, a virtual network has been built and some tests have been made in order to check if your system is ready. Now we can work with our first application. In order to make a blockchain network, we will use docker to build virtual computers that will handle different roles. In this tutorial we will stay as simple as possible. Hyperledger Fabric needs a lot of certificates to ensure encryption during the whole end to end process (SSL, TSL, authentification…). Fortunately, the Fabric SDK Go provides them. In order to use them, we simply use the network deployed by the testing part of the SDK. Now if we use docker-compose, we will setup two Fabric Certificate Authorities with one peer for each. Peers will have all roles: ledger, endorser and commiter. In addition, an orderer is also created with the solo ordering algorithm (no consensus is made). You will see a lot of logs with different colors (for your information, red isn’t equal to errors). Tips: when the network is stopped, all containers used remain accessible. This is very useful to check logs for example. You can see them with docker ps -a. In order to clean up these containers, you need to delete them with docker rm $(docker ps -aq) or if you have used a docker-compose file, go where this file is and run docker-compose down. Tips: you can run the docker-compose command in background to keep the prompt. To do so, use the parameter -d, like this: docker-compose up -d. To stop containers, run in the same folder where the docker-compose.yaml is, the command: docker-compose stop (or docker-compose down to clean up after all containers are stopped). We add a new folder named blockchain that will contain the whole interface that communicate with the network. We will see the Fabric SDK Go only in this folder. // and act on it. We won't use it for now. At this stage, we only initialised a client that will communicate to a peer, a CA and an orderer. We also made a new channel and connected this peer to this channel. See the comments in the code for more information. // as that will trigger warnings from the go tool. As you can see, we fixed the GOPATH of the environment if it’s not set. We will need this feature in order to compile the chaincode (we will see this in the next step). Great! We initialised the SDK with our local network. In the next step, we will interact with a chaincode. The Fabric SDK generates some files, like certificates and/or temporally files. Shutting down the network won’t fully clean up your environment and when you will need to start it again, these files will be reused to avoid building process. For development you can keep them to test quickly but for a real test, you need to clean up all and start from the beginning. How clean up my environment ? @echo "Sleep 15 seconds in order to let the environment setup correctly"
finally the app will be up and running. // This function is called only one when the chaincode is instantiated. // So the goal is to prepare the ledger to handle future requests. // All future requests named invoke will arrive here. // In order to manage multiple type of request, we will check the first argument. // Like the Invoke function, we manage multiple type of query requests with the second argument. We choose to put the chaincode here to make the application simpler, but from an architecture point of view, it will be better to use the architectural given by the SDK and put the chaincode in the src folder of fixtures. The chaincode isn’t really related to the application, we can have one repository for the app and another for the chaincode. For your information, in a near future, the chaincode could be written in other languages. For now, the chaincode does nothing extraordinary, just put the key/value hello/world in the ledger at initialisation. In addition, there is one function that we can call by an invoke: query hello. This function gets the state of the ledger, i.e. hello and give it in response. We will test this in the next step, after successfully install and instantiate the chaincode. Tips: take care of the chaincode version, if you want to update your chaincode, increment this number. Otherwise the network will keep the same chaincode. Tips: the installation and the instantiation don’t need to be run at every start of the application. Only when we update the chaincode (and the chaincode version). A solution is to provide an argument when we run the application to tell to do this additional procedure before move on. Since in this tutorial we will clean up the environment every time we don’t really care about that. Like a database, the chaincode is plugged and ready to answer. Let’s try the hello query. The next thing to do in order to make a basic tour of the Fabric SDK Go, is to make a request to the chaincode in order to change the ledger state. We also can make this usable for any user. The best choice is a web application and we are lucky because the Go language natively provides a web server handling HTTP requests and also templating for HTML. We use the MVC (Model-View-Controller) to make it more readable. The Model will be the blockchain part, the View are templates and Controller are provided by functions in the controllers directory. And finaly, we change the main.go, in order to use the web interface instead of directly query the blockchain. The home page make a query in in the blockchain to get the value of the hello key and display it. The request page has a form to change the hello value. After a successful submission the transaction ID is given. We can see the change by going back to the home page. It’s the end for the first part. A more complex application is coming. CLI: An example CLI for Fabric built with the Go SDK. Cool. A very good introductory material. Looking forward to a more sophisticated application example. BTW, I’d be great if you could upgrade this tutorial and your upcoming one the v1.0.0 or v1.0.1 (depending on stability and differences). Thanks again. Thanks for your feedback! We are waiting that the Fabric SDK Go are fully stabilized. Even now, there is big changes and we don’t want to edit this post every week. Thank you for letting me know how to use fabric SDK. I am very looking forward to see the next part. Thanks, we will work on it soon! Are you using the “localhost” in your configuration ? TSL certificates provided by the Fabric SDK Go work only on the “localhost” domain. In your error, the orderer can’t broadcast because the peer’s certificate is invalid (the connection is with 0.0.0.0 instead of localhost). Check your configuration and try again. Thanks for Great, step-by-step tutorial! Using your approach i have successfully deployed the hyperledger fabric. Now, I want to create 2 instance of the same hyperledger fabric one running on windows and one running on ubuntu, it will be done using your tutorial. Can you please provide some guidance how these two different instance(windows and ubuntu) share the common hyperledger fabric blockchain and changes done through invoke query on one machine will be reflected on the other one? I’m glad that you succeed to make your app work. You will need to build a Hyperledger Fabric environment shared between both systems. After that, use the same certificates for both applications to contact peers and membership (of the Hyperledger Fabric) in order to test if it works. Then you can create more certificates and users to identify which app is sending transaction for example. 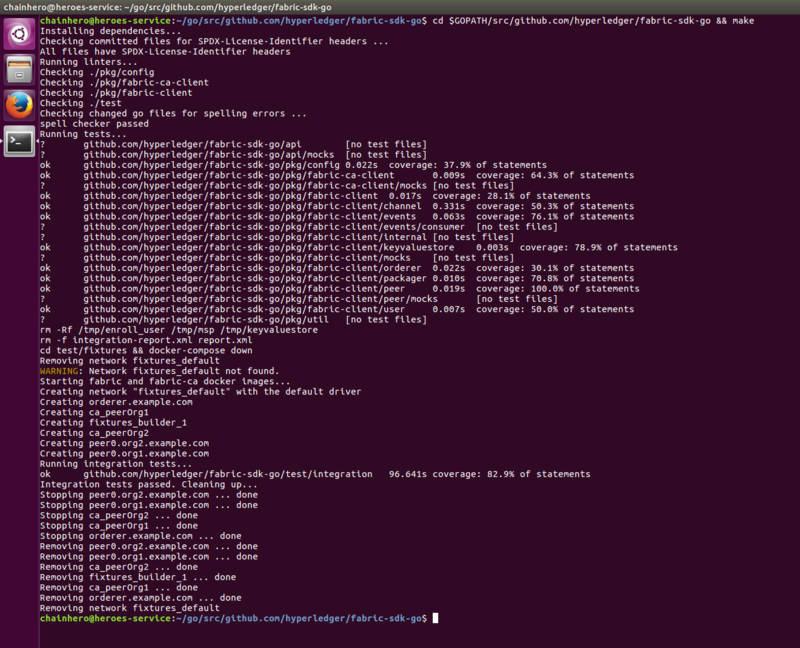 sudo apt install libltdl-dev … can you please let me know how to install this on mac …. The dependencies.sh script just runs a few go get commands. Are you sure that you have installed Golang correctly? To be sure, run go version and check that the right golang version is displayed. If the result is command not found, check your path variable: echo $PATH (you need to see the path to go executable). If not, reinstall Golang like it is explained in this tutorial. So, I’m getting “YOU MUST FIX THE FOLLOWING GOIMPORTS ERRORS:” do you know how to fix this? Go into your cloned Fabric SDK Go repository (ex. ~/go/src/github.com/hyperledger/fabric-sdk-go) and check that every file are not changed (git status). Do you know what else issue could be? Looks like the issue is with linters, could you please advice what to do? Hi all, I just tested it from the beginning and I don’t have any issues at all. Are you on Windows, Mac or Linux ? Thanks. It is really a good guide for me and I am just waiting for your next part. 09:27:47.398 [bccsp_sw] DEBU : KeyStore created at [/tmp/msp/keystore]. 09:27:47.399 [bccsp_sw] DEBU : KeyStore created at [/tmp/msp/keystore]. Check right on every directory (they need to have the execution right for your user) and check that the key have the read and the execution for your user too. If you clone the repository directly from github, you also can check that every file are not changed from the HEAD. 14:30:02.608 [bccsp_sw] DEBU : KeyStore created at [keystore]. I think there is an error with: security.hashAlgorithm: "SHA2"
Can you please suggest why it fails to execute golint ? I tried to run some test standalone go files on my desktop, they work fine. 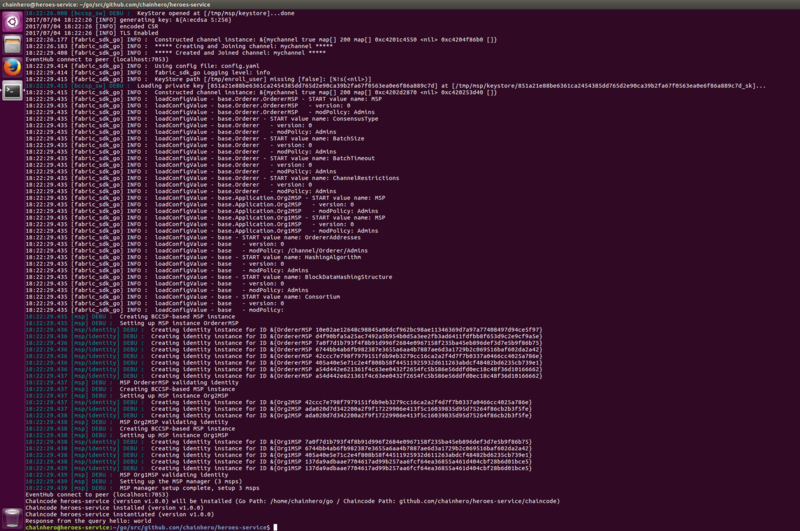 The golint binary is not found in your PATH (it is normally installed in $GOPATH/bin). Check that you correctly setup your Golang workspace and make sure that in the $PATH environment variable is the path to the bin folder of your $GOPATH. When execute “go build” command the following error comes. Check the import part of your blockchain/setup.go file. I think you should see something like that: bccspFactory "github.com/hyperledger/fabric-sdk-go/vendor/github.com/hyperledger/fabric/bccsp/factory"
Change this line by: bccspFactory "github.com/hyperledger/fabric/bccsp/factory"
The object configImpl come from github.com/hyperledger/fabric-sdk-go/vendor/github.com/hyperledger/fabric/bccsp/factory and bccspFactory.InitFactories function come from github.com/hyperledger/fabric/bccsp/factory. There is a misused in that part, check your imported packages, your vendor directory, go inside fsgConfig.InitConfig function to see see what’s going on. Are there any other fixes you can propose because this is the only thing stopping me from launching the network ? Today there is newer versions of Hyperledger Fabric and Fabric SDK Go. Maybe, the version of Hyperledger Fabric in the vendor directory of the SDK is not the good one. You can clone the application directly and run it, in order to see if it come from your code or not. But, I launched the application a few weeks ago and had no problems. You have the same issue as Batu, see my reply. You have a problem of indentation I guess. Have you found the solution to this error? the solution is to copy the files manually from their repo and then you will get another error saying methods are missing. Seems like the hyperledger docs are old and rarely updated. I am facing same issue as you posted. Could you post how did you resolve it ? On this page: https://github.com/chainHero/heroes-service/blob/master/fixtures/docker-compose.yaml, click on the “raw” button on top of the code and copy the raw text to your file. This should solve the error. Good luck! Why the transaction ID displayed in browser differs from the transaction ID in the blockchain? So your chaincode can’t be installed properly and them when you make your query, an old chaincode is used. WARNING: Network fixtures_default not found. Your second issue is very strange, it’s when you run the integration tests ? The CA seem to not be started correctly. Try to find the CA error log before this error. Hi, I am newbie for hyperledger fabric and I have same issue with the second one. “The CA seem to not be started correctly” means that I need to run fabric-ca like ‘fabric-ca-server start -b admin:adminpw’? When I run it, then “make” complains the port 7054 is already used. And where can I find CA error? No, don’t start the CA by hand, let Docker do it. – To stop the docker-compose command, just use Ctrl+C and to use make clean to clean up. I followed your instruction. And Here are some bad logs. Intentionally, I didn’t list WARN messages here. But the messages above looks serious because I checked ca_peerOrg1 and fixtures_builder_1 are not running when I run docker-compose up. 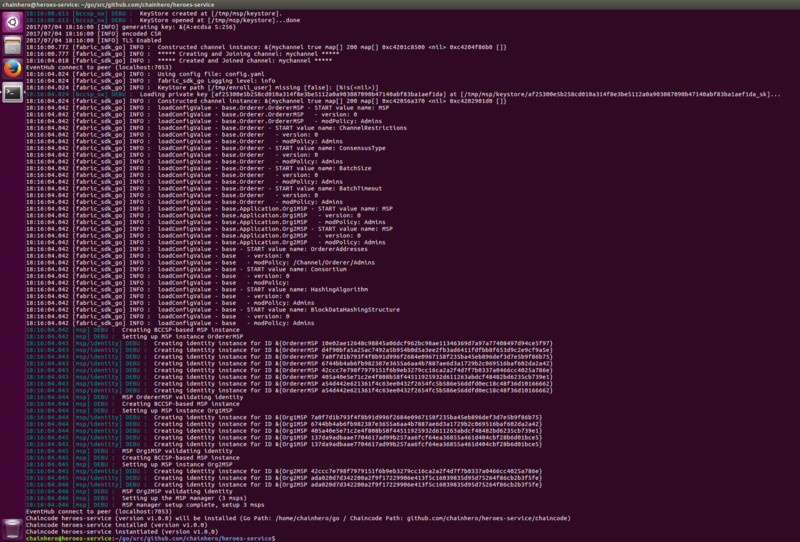 For docker logs with them, fixtures_builder_1 has no log but ca_peerOrg1 has the log like this. And one more thing, root of the project means “fabric-sdk-go” directory, right? But I cannot run “make dev” and the Makefile doesn’t have “dev:”. The root of the project means “$GOPATH/src/github.com/chainhero/heroes-service”. You need to setup the Makefile in order to run “make dev”. Yes your error come from the missing file “/etc/hyperledger/fabric-ca-server-config/server_localhost.pem”. Are you sure that every files are here ? Compare with the github repository. I think you have something different. I finally find out where come from this issue! A new version of docker or docker-compose has deactivated the possibility to make multiple mounting point to the same destination. In the CA container it was the case. I change the docker-compose.yaml and now all works correctly with the old and the new docker version. I hope there won’t be any more problems like that. Very Good Tutorial. Ran into many of the same errors as the ones posted. They were on my end and easy to debug. Appreciate this. Good tutorial! Unfortunately it uses an older version of the sdk (for example pkg/util is no more in the current branches). Any plans to update to a newer version? I will try to upgrade this tutorial to the Hyperledger Fabric version 1.0.5 and the last release of the SDK Go. It’s not a huge job, but we have to find the time. Missing dependency. Aborting. You can fix by installing the tool listed above or running make depend-install. Maybe your GOPATH is not setup correctly. Check the installation part of the tutorial. Can you please suggest what could be the issue? This error seems to be due to a problem with the installation of Go. Try to reinstall the last Golang version. First of all thank you for this nice tutorial. I am seeing this error , would you suggest what to do ? You might be seeing this error because you're using the wrong Compose file version. Either specify a version of "2" (or "2.0") and place your service definitions under the `services` key, or omit the `version` key and place your service definitions at the root of the file to use version 1. Your docker-composer.yaml file probably not quite indented. when i run this : localhost:3000/home.html in my web browser. You must look at the error message that appears in the terminal. The Hyperledger Fabric network is well launched? I have created a basic blockchain application with 4 participants in hyperledger composer platform. 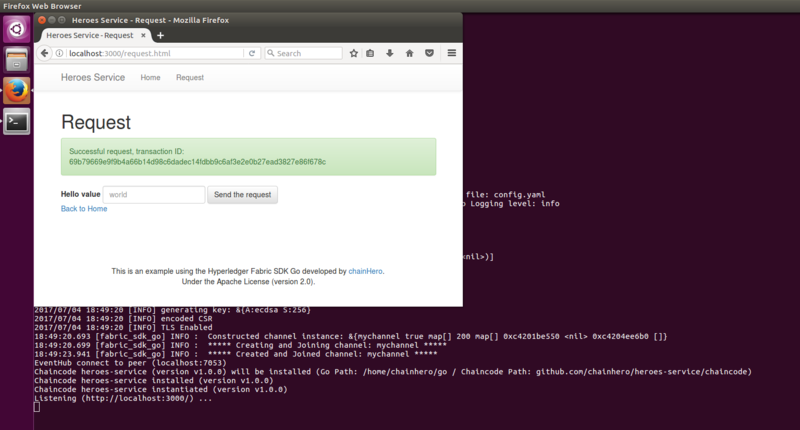 Now, I want to deploy the application in the network with 4 participants (peers). All peers are allowed to do different different task. Please suggest me sir about how to start deploying and making network of 4 peers. You need to create a new Hyperledger Fabric network. To do this, checkout the official documentation, there are tools to do this automatically. There must be a problem with environment variables, such as GOPATH. Check the installation part. If not, we are currently working on updating this tutorial, come back in a few days to get the latest version. Read the tutorial correctly, your Go installation is not correct. The GOPATH and GOROOT are not good. Thank You for your suggestion, It was very helpful and I have installed successfully. Now I’m trying to communicate between two peers(2 hyperledger fabric frameworks). Can you please share some documents or any ideas related to it. You didnt mention how to create (github.com/chainhero/heroes-service/web) web directory and its contents in this tutorial. when i ran: go build it returns errors. test/integration/base_test_setup.go:129:2: redundant if ...; err != nil check, just return error instead. 2018-01-30 18:07:00.076 CET [bccsp] GetDefault -> WARN 008 Before using BCCSP, please call InitFactories(). Falling back to bootBCCSP. 2018-01-30 18:07:10.078 CET [bccsp] GetDefault -> WARN 00a Before using BCCSP, please call InitFactories(). Falling back to bootBCCSP. 2018-01-30 18:07:10.078 CET [bccsp] GetDefault -> WARN 00b Before using BCCSP, please call InitFactories(). Falling back to bootBCCSP. 2018-01-30 18:07:10.079 CET [bccsp] GetDefault -> WARN 01e Before using BCCSP, please call InitFactories(). Falling back to bootBCCSP. 2018-01-30 18:07:10.080 CET [bccsp] GetDefault -> WARN 01f Before using BCCSP, please call InitFactories(). Falling back to bootBCCSP. 2018-01-30 18:07:10.080 CET [bccsp] GetDefault -> WARN 020 Before using BCCSP, please call InitFactories(). Falling back to bootBCCSP. 2018-01-30 18:07:10.081 CET [bccsp] GetDefault -> WARN 022 Before using BCCSP, please call InitFactories(). Falling back to bootBCCSP. 2018-01-30 18:07:10.081 CET [bccsp] GetDefault -> WARN 023 Before using BCCSP, please call InitFactories(). Falling back to bootBCCSP. 2018-01-30 18:07:10.082 CET [bccsp] GetDefault -> WARN 039 Before using BCCSP, please call InitFactories(). Falling back to bootBCCSP. 2018-01-30 18:07:10.083 CET [bccsp] GetDefault -> WARN 03a Before using BCCSP, please call InitFactories(). Falling back to bootBCCSP. 2018-01-30 18:07:10.083 CET [bccsp] GetDefault -> WARN 03b Before using BCCSP, please call InitFactories(). Falling back to bootBCCSP. 2018-01-30 18:07:10.084 CET [bccsp] GetDefault -> WARN 03c Before using BCCSP, please call InitFactories(). Falling back to bootBCCSP. On January 4th you said that you found a problem with multiple mount points on the docker-compose.yaml, and that you had fixed the issue. I am having the same issue, and I just downloaded the latest version of the files. Any pointer to fix the issue of the missing “/etc/hyperledger/fabric-ca-server-config/server_localhost.pem” will be appreciated. And, thanks a lot for the excellent tutorial. Hi, try cloning the heros-services repository from github using the v1.0.0.0-rc1 branch (https://github.com/chainHero/heroes-service/tree/v1.0.0-rc1). Launch the application and check if the error is still present. If this is the case, I will investigate in more detail otherwise it is that there is a difference between your files and those present on the github repository. Hello ! Thanks for you very nice tutorial, really good job ! I found my mistake ! I get the following issue when I execute “go build”. I am unable to find a fix for this issue. 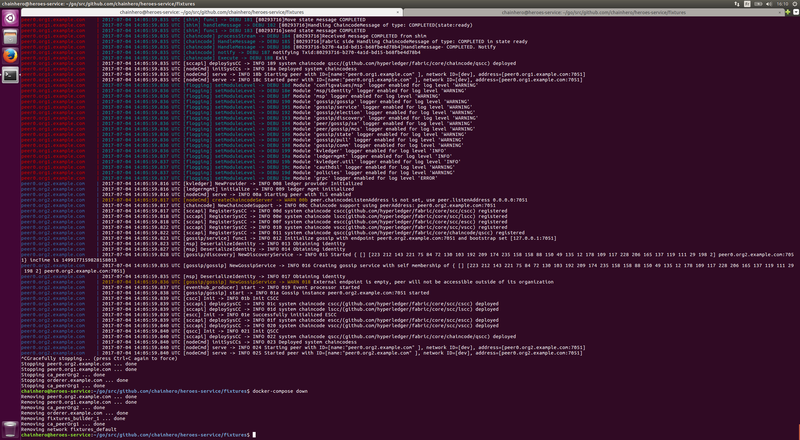 I followed the steps mentioned and got the latest files for config.yaml, setup.go and main.go. Not sure what I am missing. Hi, why don’t you use the standards for GOROOT and GOPATH? (as is done in the tutorial). I feel like that’s the problem. Hi nice article and also helpful. It’s very strange, I don’t have any of this on my side and I don’t see why you only have it. failed to dial localhost:7050: context cancelled; please retry. blockchain/setup.go:10:2: imported and not used: "github.com/chainHero/heroes-service/vendor/github.com/hyperledger/fabric-sdk-go/third_party/github.com/hyperledger/fabric/common/cauthdsl"
blockchain/setup.go:12:2: imported and not used: "github.com/chainHero/heroes-service/vendor/github.com/hyperledger/fabric-sdk-go/api/apitxn/chclient"
We have made some improvements and we have corrected this kind of problem. I just finished a complete test on the new tutorial, everything should work fine now. I’m trying to develop my own network based on your application and I encounter errors concerning the orderer and the consortium value and application version. With configtxlator I checked what’s inside your .tx and your genesis block and the layout is very different from the ones I generated with configtxgen (fabric v1.0.5). Is it possible to see the files (configtx.yaml and crypto-config.yaml) you used to create your network ? With wich version of these tools did you generate your .tx and .block ? The network was generated with the version v1.0.0-rc1 of fabric, you must recover this version to rebuild an identical network. The configurations come from the network generated for the example in the Fabric SDK, I don’t have them. I’m working from the newVersion branch. Leaving a comment was the easiest way I found to contact you. Every time I want to adapt it to my needs I got some errors. So If I understand correctly, you generated orderer.genesis.block, chainhero.channel.tx and org1.chainhero.anchors.tx with the version v1.0.0-rc1 of the binary configtxgen ? Because depending on which version of the binary I use (the one from fabric-samples and the one from fabric), I don’t have the same result (after being decode by configtxlator). It seems that the app doesn’t accept certain version of these artifacts. That’s why i’m asking you which version you used to generate the artifacts and what the config files look like (And I don’t think you used the files from fixtures/old). I got this problem, can you help please. docker: Error response from daemon: manifest for hyperledger/fabric-tools:latest not found. out of sync. This may cause problems. This is not at all related to this tutorial, if I understood correctly you are trying to create your own Hyperledger Fabric network. According to your error messages, you are missing some Docker containers. Try to recover (pull) the missing containers and add the tag “lastest” on them. This should correct your problem. drwxrwxr-x 2 ahu ahu 4096 May 17 21:47 .
drwxrwxr-x 9 ahu ahu 4096 May 20 20:22 ..
Also tried following command but cannot really understand the output below. 2018-05-20 20:40:57.505 PDT [common/tools/configtxgen/localconfig] LoadTopLevel -> CRIT 002 Error reading configuration: Unsupported Config Type ""
Please see if there are any obvious mistake that I may have overlooked? Thanks for putting this great tutorial! You are using an old version of the tutorial. Part e suggests code edits and then links to the file on github. The code is different and I can’t either one to work. Shouldn’t the code be the same? This tutorial is only the reflection of this repository https://github.com/chainHero/heroes-service/tree/v1.0.0-rc1, which is the old tutorial. Are you sure that you are looking at the good branch ? If so please quote where the difference is. Note that the link that you are talking about show the final file. Nevertheless, I would recommend you to use our new tutorial : https://chainhero.io/2018/03/tutorial-build-blockchain-app-2/. ./heroes-service was not creating for me why? When I switch to v1.0.0-rc1 branch and cd to fixtures, run `docker-compose up`. 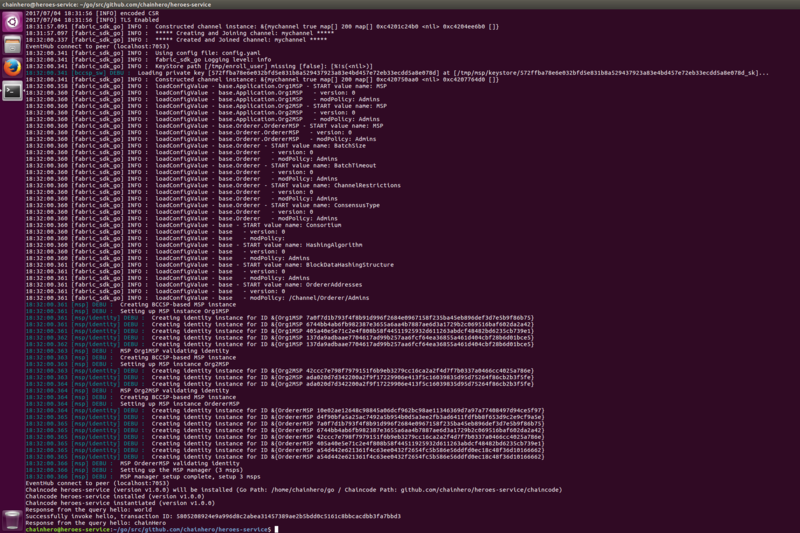 root@ubuntu:~/go/src/github.com/root/heroes-service/fixtures# docker-compose upWARNING: The FABRIC_BUILDER_FIXTURE_IMAGE variable is not set. Defaulting to a blank string. WARNING: The ARCH variable is not set. Defaulting to a blank string. WARNING: The FABRIC_BUILDER_FIXTURE_TAG variable is not set. Defaulting to a blank string. WARNING: The FABRIC_PEER_FIXTURE_IMAGE variable is not set. Defaulting to a blank string. WARNING: The FABRIC_PEER_FIXTURE_TAG variable is not set. Defaulting to a blank string. WARNING: The FABRIC_ORDERER_FIXTURE_IMAGE variable is not set. Defaulting to a blank string. WARNING: The FABRIC_ORDERER_FIXTURE_TAG variable is not set. Defaulting to a blank string. WARNING: The FABRIC_CA_FIXTURE_IMAGE variable is not set. Defaulting to a blank string. WARNING: The FABRIC_CA_FIXTURE_TAG variable is not set. Defaulting to a blank string. Thanks for a good tutorial. What are the changes I should make , if i want to run this application using multiple systems? We always search of new enthusiastic co-workers that are able to give new perspectives and new experiences to our client and products. If you search a stimulating place where there is plenty of technical challenges, do not hesitate and join us !